Are you ready for some serious splashy fun? 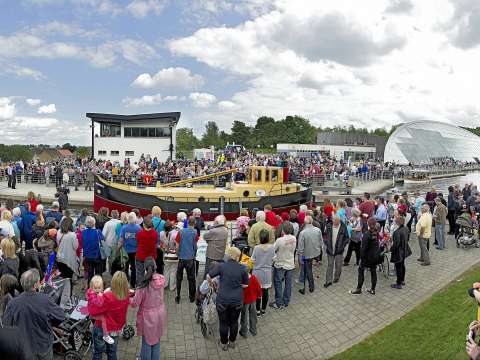 Clamber across Scotland on the huge stone map, pilot a boat from coastline to canal, work the mini canal lock gates or find out how The Falkirk Wheel is powered in our Splash Zone! Registration is now open for this years Lock'n'Paddle! With easy access from Glasgow and Edinburgh, the two cities’ airports, and the whole of Central Scotland, The Falkirk Wheel is a unique and highly memorable venue. Spring into your dream job with Scottish Canals! We're recruiting for a range of roles including cafe and retail assistants, waterway operatives, housekeepers and chefs! Situated approximately 23 miles from both Glasgow and Edinburgh, The Falkirk Wheel is easily accessible in the heart of Scotland.